▼ Click or tap the name of the facility in the illustration below to see the summary of each. We also have videos of the Premises of Hongyoji taken by Drone! Please also see from the "Drone Voyage Tour Hongyoji" button at the bottom of this page. 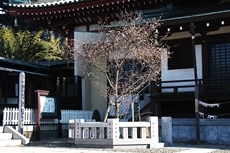 After Nichiren Shonin passing away, Ikegami Uemon Tayu Munenaka, Sakuji Bugyo of the Kamakura Shogunate, donated a land, on which a temple called Choso-zan Hongyoji Temple was constructed. 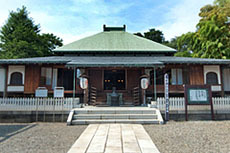 The Hondo underwent major renovation in 1981 as a project to commemorate the 700th death anniversary of Shonin. 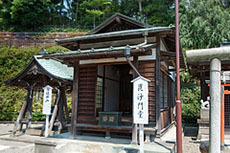 This hall was built on the site where the room in which Nichiren Shonin passed away existed. 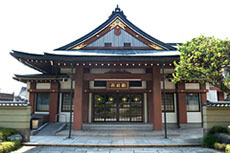 In 1936, the Tokyo Metropolitan Government designated the hall as one of its official historic sites. 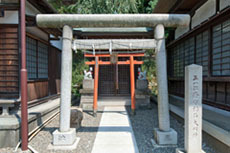 The visitors are able to touch a part of a pillar on which Shonin leaned over during lecture on Rissho Ankoku Ron during his stay. 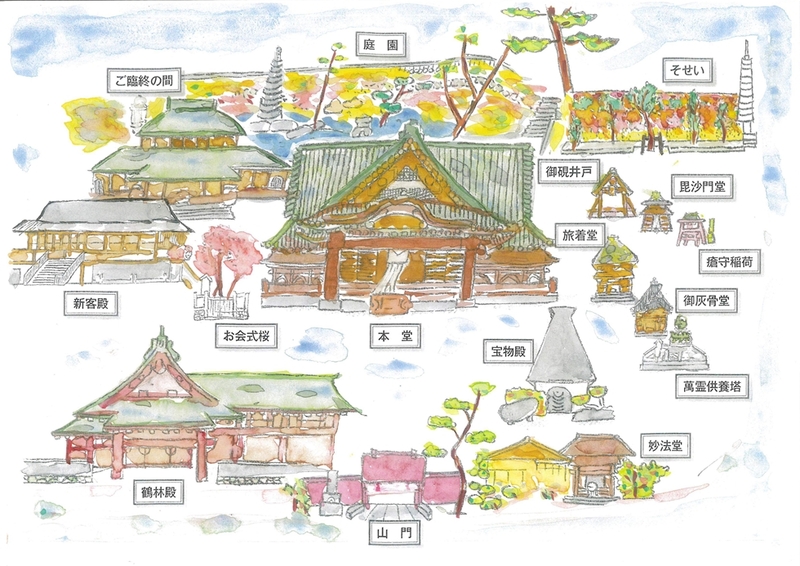 Kakurin-den was constructed as a project to commemorate the 700th death anniversary of Ikegami Munenaka, a founder of the temple. 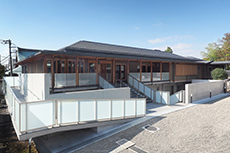 This hall is available for a variety of uses for the believers of Nichiren Sect, including funeral, Buddhist memorial service as well as wedding, tea ceremony, various meetings, etc. This cemetery accepts the cremains, regardless of religious sect of the deads, for a permanent memorial service. This cemetery can be utilized by a person without successor with peace of mind. When Nichiren Shonin passed away, a cherry tree came into unseasonable bloom in October in the lunar calendar (November or December in New Calendar). Based on this legend, the lanterns used in a memorial service for Nichiren are decorated with cherry blossoms. The cherry tree still exists on the premises and blooms around the time of the anniversary of Nichiren Shonin's death. Next day of the arrival from Mt. 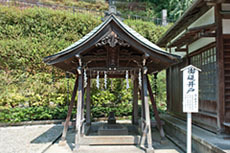 Minobu, Nichiren Shonin used water from this well to rub down an inkstick to write letters, including a gratitude letter to Lord Hakii Sanenaga, who had offered protection to Nichiren for nine years. 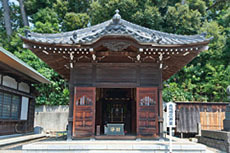 After the death of Nichiren Shonin, he was cremated and an ossuary was constructed to enshrine the ashes (incorporating the sacred bones). 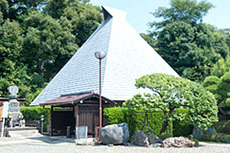 The present ossuary was a former mausoleum of Honmonji Temple, which was moved to here in March 1979. 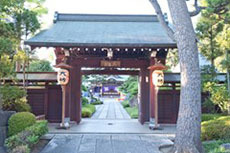 This is a front entrance of Hongyoji Temple. 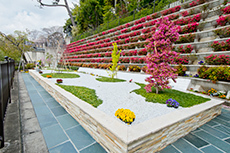 A slope called Daibo-saka extends to Ikegami Honmonji Temple and a crematory. The Shinpen Musashi Fudo Kiko (a topography of Musashi Province) describes; "Daibo-saka is found on the right of Daibo-saka Hojo. Its name comes from as it's path to Daibo." 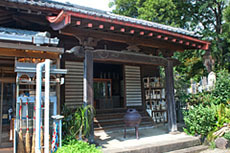 The hall houses a statue of Nichiren Shonin in travelling attire sculptured by one of the senior disciples for thinking about the goodness of the deceased Shonin. n commemoration of public honor award of Historical Temple won by Hongyoji Temple, this hall was constructed, which houses Hokke-ky? hangi, an Important Cultural Property of Tokyo, the oldest Itahi in the sect, the principal image of master, letters, etc. The god Inari was constructed in mid-Edo era as a god of harvests, in particular, for protection from disease in Hiimonya Meguro. By fate the Inari was moved up to Hongyoji Temple in 1982. 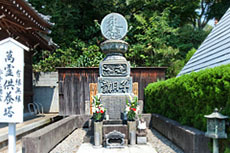 Banrei Kuyoto was constructed for a memorial service to all souls, which is available for the people without tombs in Hongyoji Temple, including for holding a religious service for a miscarried or aborted fetus or stone stupas used as memorials for the dead. Two goblin gods called Myoho Ryo Daizenjin are enshrined. They are two goblins living in the foot of Mt. Minobu, who are believed as gods to protect the people from fire and theft. 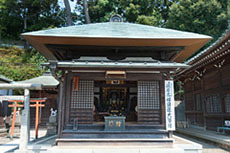 This is a hall for Bishamonten (Vai?rava?a) followed by an attendant called Yasha. Bishamonten is the guardian of the northern direction, the leader of Darkness, and the guardian of unlucky direction. Before Muromachi Era, Bishamonten used to be the strongest god among the Four Kings and was worshiped as the god for protecting the country, the god of war, and the god for victory in war. 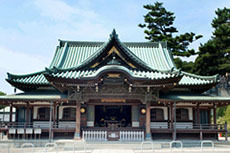 After Muromachi Era, Bishamonten was worshiped as the god for giving secular benefits, treasure and happiness. According to legend, since Bishamonten had too much treasure, he burned down treasure three times a day. Also, he does not give happiness, unless you pray for any of the following: your parents, national land, the people, or Bodhi. 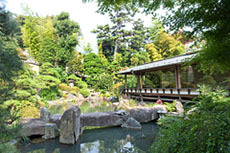 The Japanese garden is located behind the Gorinjyu no Ma. The office also accommodates a waiting room for the attendants to a Buddhist memorial service, meeting space and tea room. Designed for various uses by the believers, the office was constructed in 2015 as a project to commemorate the 800th death anniversary of Shonin. We also have videos of the Premises of Hongyoji taken by Drone. We introduce the whole view desired from the sky and the main facility including "Gorinju no Ma" for 2 minutes 40 seconds. Please also see !